One field trip your students will always remember is to the Michigan Capitol building in downtown Lansing, a National Historic Landmark. Our state’s third capitol building, the Victorian-era structure was dedicated in 1879, more than 40 years after Michigan was granted statehood. It has withstood the test of time, and each year more than 115,000 people tour the building, watch the state legislature in session, view more than nine acres of art on the walls and ceilings, and hear tales of Michigan’s past within the walls of the historic structure. Teachers may also be interested in touring the nearby Michigan Library and Historical Museum, all of which can be arranged through the reservation service at the State Capital. Find out ahead of time about the art and architecture with resources provided by the State of Michigan, and include it in your lesson plan before your trip. As old as our state Capitol building is, the 18th century fort and fur trading village of Michilimackinac pre-dates it by well more than 100 years. Within view of the Mackinac Bridge, a visit to Colonial Michilimackinac will take your students back in time to the days of French trappers, British Red Coats and Pontiac’s Uprising. The fort offers audiovisual programs in the theaters, a kids’ rendezvous area exploring fur traders’ routes, many special exhibits, and 16 authentic buildings to explore. For the budding archeologists in your group, there are also ongoing excavations by real archeologists taking place from early June through mid-August. The “dig” began in 1959 and is one of the longest ongoing excavations in the United States. 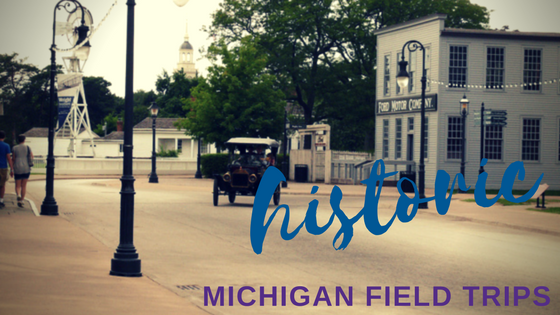 No Michigander’s education is complete without at least one trip to The Henry Ford, Greenfield Village or both! Telling the true story of the drive and innovation that built the automotive industry, and the nation over 300 years; there is so much to see and do you will want to plan your visit to get in as much as possible. Among the many options are one of the world’s largest collections of Americana, the Museum of American Innovation, a tour of the Rouge Factory, a giant screen theater offering new state-of-the-art 4K digital projection sound and seating, and the always awesome Greenfield Village experience with Thomas Edison’s lab, Model T rides, and artists creating right before your eyes. Students can even watch a baseball game as it was in in 1867 and order lunch from an 1830s menu! Surrounded by water as we are, a field trip to learn about the history of life on the Great Lakes can be an eye opener for children who think of the lakes as a day at the beach, not a way of life. The Michigan Maritime Museum in South Haven will introduce your students to centuries of Great Lakes maritime history, including boat building, mysteries and shipwrecks, and even replica and original boats from times go by. In 2017, the Michigan Maritime Museum was ranked in the Top 10 Maritime Museums by Marina Life magazine! When your tour is complete, you can finish your field trip on the beautiful sandy beaches of Lake Michigan! Plan ahead and get admission information here. One of the world’s most ingenious and massive engineering marvels, the Soo Locks near Sault Sainte Marie, allow ships to pass between Lakes Superior and Huron via the St. Marys River, the only connecting waterway. The locks are needed because at the northern end of the river, the water drops 21 feet in less than a mile, prohibiting the safe passage of boats and ships. The first lock was built in 1798 and the last in 1968, and depending upon the lock, it takes 10 to 22 million gallons of water to raise the level 21 feet. The Soo Locks represent more than 200 years of Michigan history and to this day continue to allow ships as long as 1,000+ feet to pass from lake to lake, delivering and picking up cargos that help run the country and the world. Find out more! This one-of-a-kind field trip will delight students of all ages because it is both fun and educational. Long known for its Dutch traditions, the Nelis’ Dutch Village replica in Holland offers well-planned school field trip itineraries that include movies, demonstrations, a petting zoo, old fashioned carnival rides, and special admission rates. Along the way students will gain a better understanding of life in 18th century Netherlands, how they worked and how they played. Celebrating 60 years in 2018, Nelis’ Dutch Village makes memories your students will treasure. No matter how near or far your field trip is, Indian Trails has more than 100 years of group transportation expertise to share with you and your students. Need more information about charters? Read more here or contact us for a quote today!